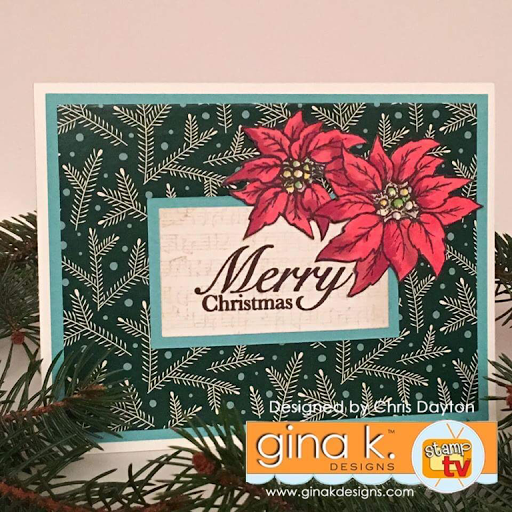 The Cast and Crew for Gina K Designs welcomes you to another fabulous blog hop celebrating the new Home for the Holidays Stamp TV Kit and a number of gorgeous stamp sets by our illustrator team! We hope to inspire you with some beautiful card projects as you hop along to each of the designer's blogs! Today we are featuring Melanie Muenchinger's new Holiday Frame stamp set and Theresa Momber's new Dashing stamp set. Both Melanie and Theresa have hand drawn these beautiful images that will allow you to male a card that is personalized with images that you will not find anywhere else! Today I am sharing a card made with Melanie Muenchinger's new set, Holiday Frame. What a fun set with so many possibilities! Today I used the full frame stamp, but decided to paper piece in the sections with various papers and textures. 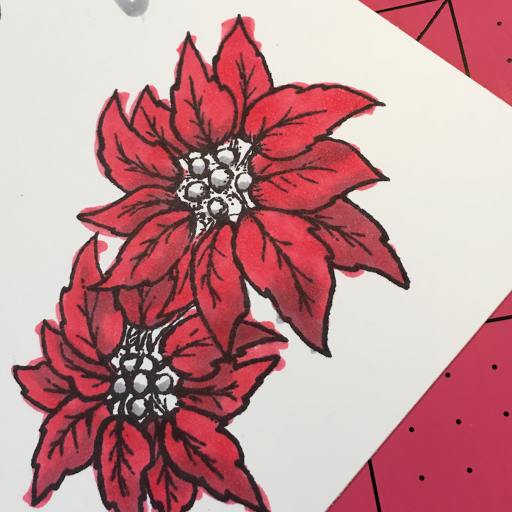 I began my card by stamping the full frame four times: on a White Pure Luxury heavyweight card base, on the red patterned paper from the kit, on a piece of Turquoise Sea card stock, and on a piece of 90# cold press watercolor paper. Because I planned to watercolor images in the central circle, I used Versafine Onyx Black ink. I stamped the small log cabin, trees and snowman images within the circle with Versafine, then watercolored them using Spectrum Aqua watercolors. I prefer to use these markers by scribbling onto a palette, then use a paintbrush to pick up ink and watercolor with. I feel I have more control when I paint with a brush. Once my painting had fully dried, I fussy cut the circle out. I stamped the sentiment onto my Turquoise Sea piece with Christmas Pine Green ink. I dry embossed the Turquoise Sea panel with a scroll-y embossing folder before cutting out the two pieces I wanted for my card. I also fussy cut the other sections from my patterned paper. I cut just with in the black ink lines, and adhered them to my white heavyweight card base. My next card is simple card that would be easy to mass produce. This one uses images from the Dashing stamp set. This is a one layer card, created on Ivory Heavyweight Pure Luxury card stock. I used Post-It tape to mask off the edges of my card front. By covering each of the sides 1/2", it left plenty of room to create the central focal image. I tore a piece of Post-it tape to create a mask that I would use to create the hazy, snowy foreground. Beginning at the top of my panel, I used a sponge dauber to layer in Charcoal Brown ink. I continued layering more ink as I moved my tape mask downward, allowing the ink at the foreground to be the lightest. 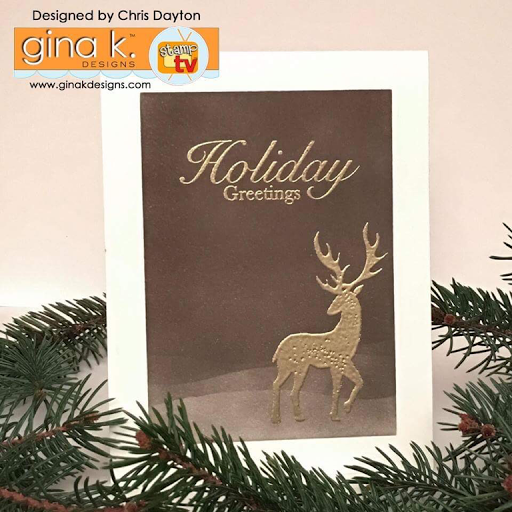 When I was satisfied with the depth of color, I removed the tape, and heat set the ink, to make sure it was completely dry before I stamped the sentiment and deer with Versamark ink and heat embossing with gold embossing powder. I also created this card with a few of the smaller images from the Dashing Stamp set. I began with a top folding heavyweight In the Navy card base. I used a mask that I created out of a piece of scratch paper and a 2 1/2" circle die. I placed my mask over my card base, and used a small makeup brush to sweep Ivory pigment ink in circular motions to create the moon. I smudged just a bit of Black Onyx ink with my fingertip to the edges to create a hint of shadow on the edges of my moon. 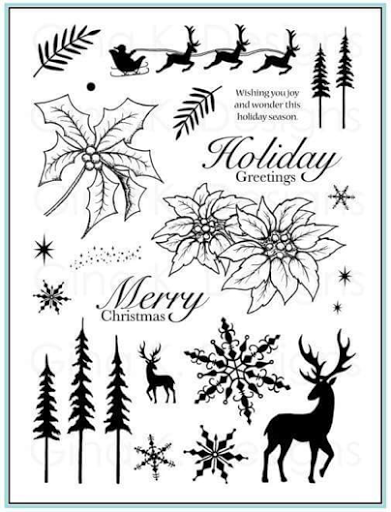 I then heat set the ink, to ensure it was very dry before stamping the santa and sleigh image and the small skinny trees with Versamark and heat embossing in black. I sponged a bit of Black Onyx ink at the base of the trees to create a bit of haze. The stars and sentiment were heat embossed in silver. My final card today is also created with images from the Dashing set. 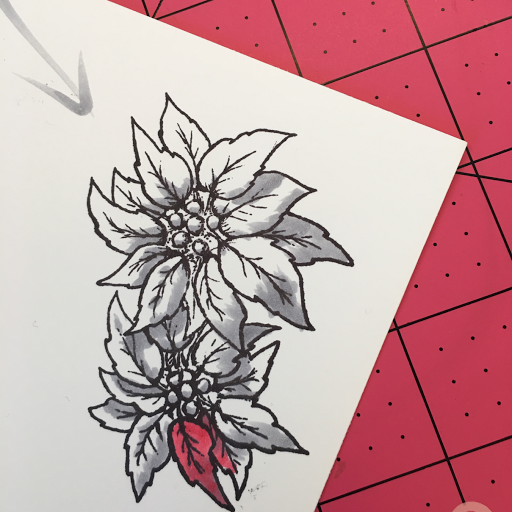 I started by stamping the large poinsettia image on White Heavyweight Pure Luxury cardstock with Memento ink. I chose a very simple and quick coloring/shading method of Copic coloring, whereas I first determined the direction of my light source, then colored the areas of shadow first with a W3 gray marker. I then colored the whole flower, including the gray areas with R35. Because I was cutting out my image, I colored quickly without worrying about staying in the lines. I decided to deepen a few areas further with R59. I used a little YG21, G14 and Y08 on the flower centers. I then fussy cut the flowers. My sentiment is created on a small piece of heavy weight white card stock. 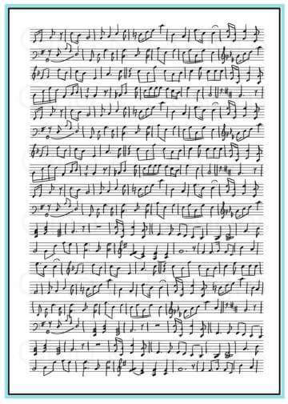 I had used second generation stamping with the Music background stamp (available in the Home for the Holidays Stamp TV Kit) using Kraft ink. The Merry Christmas sentiment is added in Charcoal Brown I created multiple mat layers using the pretty Christmas Pine patterned paper from the Home for the Holidays Stamp TV kit, and Turquoise Sea card stock and assembled all elements with adhesive on a White heavyweight card base. Links to products are provided in the descriptions above. Just click on the colored product name for the direct links to the products I used in the examples above. All products are available for purchase now from Gina K Designs. These all rock Chris! I really love your moon you created, reminds me of the Super Moon! Beautiful cards, but my favorite is the moon card. Wowza. I love it. Thanks for sharing. Love them all but the moon is spectacular. I think that is my goal today to try that technique. Thanks for the inspiration. I am over the moon for the moon you created! LOL What a perfect addition to Theresa's Dashing stamp set. And I love how you colored the poinsettias too. 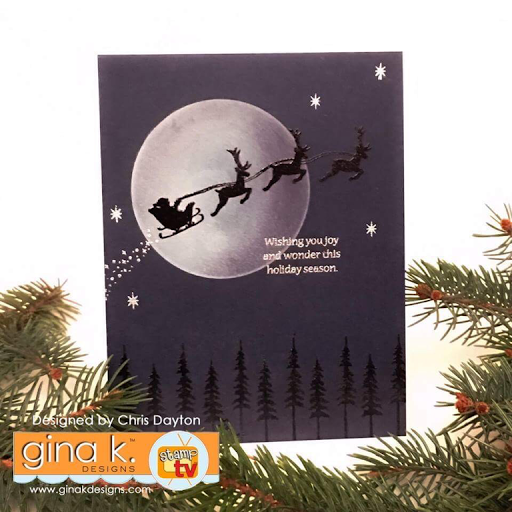 I don't know which card I like more but I can say that the moon in your santa sleigh card is fantastic and the gold embossing of the deer and greeting, wow! Great cards! WOW, all your cards are divine! Your Holiday Greeting card blew me away, it has so much depth, the deer looks like it's ready to pop off the card. Thanks for the inspiration! Awesome cards! The tutorial is wonderful. Love the texture in your frame card, the simplicity of the deer card is striking and the moon is fabulous. Great inspiration. Chris, your cards are stunning! So glad you joined Gina's team! Thanks for all the details, and for sharing with all of us! Beautiful creations! That gold embossing one is sooooo elegant! Gorgeous! Look at all these beautiful cards....love them all!!! Blown away by the gorgeousness of these creations! Your cards are magnificent! Every one of them! I can't even pick one I like more than another! The deer is beautiful. Love the trees stamped in black and the way you did the moon. The poinsettias are gorgeous. 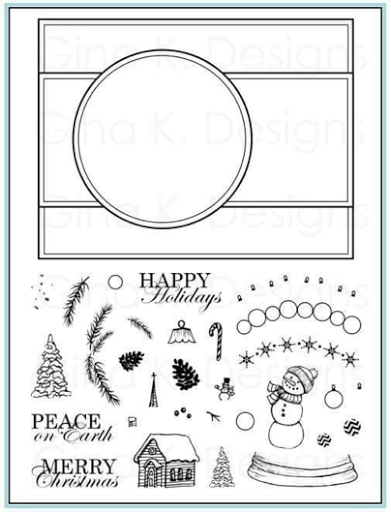 And I love the layering and borders on the Peace on Earth card. So beautiful! I'm look forward to seeing all your creations. Love them all, but especially the moon! Love all the cards. Such great inspiration! Love all the cards especially the one with Santa and the reindeer! Love all of your cards but that brown with the gold deer OMG it's beautiful!? Love all the cards you made but I too especially like the gold deer on brown CD. Great cards and wonderful inspiration! Very nice cards. My favorites are the deer & sleigh in front of the moon. It reminds me of the movie ET. I think the card sponged in brown with the gold sentiment & deer is beautiful and perfect for everyone. I have a hard time coming up with masculine cards and think this fits the bill. Wonderful work. Thank you for your lovely inspiration. They're all so pretty. Hard to choose a favorite. I like the gold embossed deer. Just gorgeous! My fav is the moon one - I saw it on FB and had to come see how you made it. All of them are gorgeous!!! These designs are terrific and wodnerufl explanation. That moonscape and brown card with the deer were so striking at the event. i love the piecing and the embossed belly band on the frame card and the photos showing your underpainting of the gray is very helpful! Wonderful variety of cards. I like the watercolored scene on the first one. Wow! You really knocked it out of the park with these cards, Chris! The scene card is a stunner, but I almost fell out of my chair with that gorgeous deer card and then the fabulous santa card. Just wow! These cards are absolutely stunning! I am definitely going to be trying these techniques! I can't even pick out a favorite! Beautiful cards, Chris! I really loved the gold embossed deer! Such beautiful cards! My definite favorite is the heat embossed dear. I will CASE this one for sure! Loving the snow globe cards......may need to get that set! One fantastic card after another. All are so well designed and the coloring on that little cabin scene card especially was wonderful. Love all the possibilities with these sets! Wow! They are all beautiful. Great cards. I love the santa/reindeer flying over the moon. Beautiful cards! Thanks for sharing the details of how you made them. Your cards are gorgeous. Thanks for providing the great details. Stunning cards. Love Santa in front of the moon. What beautiful cards, I can't make up my mind which I love the most!! Chris, your cards are just stunning! So glad you were satisfied with the charcoal brown shading I was blown away! Thank you, Chris! Your detailed descriptions are so helpful to me. I love all your cards. The way you used the patterned paper in the first card is wonderful (that frame is wonderful, too.) Some crafters don't use patterned paper, but I like it. I was happy to see that Charcoal Gray (because I just ordered it!) - you achieved such smooth, depth of color on that beautiful card. Your last two cards are also fabulous. Thanks for the explanations, again, very helpful. OK.....WOW WOW WOW! So beautiful, each one is just a masterpiece! OH, OH, OH, so much loveliness. Fabulous cards Chris, I am in love with the set stamped with the Dashing Stamp set!